For many, Summer Seminar is a life-changing event. It has catapulted the careers of many of the nation’s most successful numismatic collectors, authors and dealers, and guided young numismatists to become hobby leaders. Now celebrating its 41st year, ANA’s Summer Seminar, as always, will feature a lineup of classes to suit virtually every collector’s hobby needs. Among the many classes that will be offered at the Seminar, we have the pleasure to announce our participation in a fully focused course about cobs and shipwreck coins, intensively spread in a 5-day seminar. This year, Daniel Frank Sedwick, LLC accepted the proposal of the American Numismatic Association to hold a Summer Seminar course entitled "Cobs and Other Shipwreck Treasure Coins," being offered during Session I (June 27-July 3, 2009) at the ANA’s headquarters in Colorado Springs, Colorado. The Sedwick name has long been associated with Spanish colonial cobs and other "treasure coins" from shipwrecks around the world. Daniel Frank Sedwick has spent nearly 20 years educating cob collectors about these fascinating handstruck coins (known to Spaniards as "macuquinas") made in the Spanish colonies in the 1500s through the 1700s. 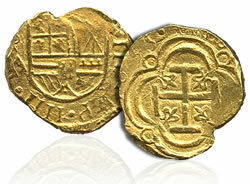 Daniel is joined by fellow experts Agustín García-Barneche and Alan Workman to cover all aspects of so-called "pieces of eight," "doubloons" and other treasure coins. Instructors: Daniel Frank Sedwick, professional numismatist and co-author of The Practical Book of Cobs; Agustín García-Barneche, author of The Macuquina Code; and Alan Workman, a specialist in treasure-related literature. Please contact the ANA now to reserve your spot in the class: (719) 482-9850 or via web at the ANA site.